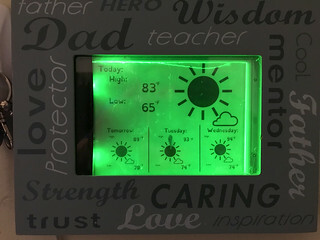 Found an excuse to finally spend some of the weekend building this weather display. Excuse the sub-par display, it looks better in person. While cutting up the plastic to use as a light prism, I scratched it a few times. The frame has been empty for 3 years, since my kid, via the wife, purchased it. I never really felt I had anything to put inside, until I found the frame again recently, and realized it could just barely fit a Kindle. The kid had worked on a server and script with me previously for a Kindle conference room schedule for ... a client (needing to charge once a month, it was framed in black, and attached to the glass from the inside giving it a very future-like look). As such, it made sense to place something that the kid and I worked on inside the fathers-day frame. Well, the concept anyway. Kid was not as excited about working on one for our house, but it still has some of his help and suggestions from a few months back. So it still counts as our project. The LEDs are green christmas tree lights, and they are connected to the contact pads on the back of the kindle. The light prism came from a damaged Dell LCD; the clear part inside the panel itself that spreads the light. The frame itself had a second larger opening on the opposite side, to hold the Kindle. I should be receiving some damaged LCDs soon to pull a better looking prism out. It also works as emergency lighting: since the LEDs are powered by the internal battery, if the power goes out, it still works. We have other LED 'emergency' lights in the house, but they are not setup to turn on when there is no power except for the office ones powered by a laptop battery.